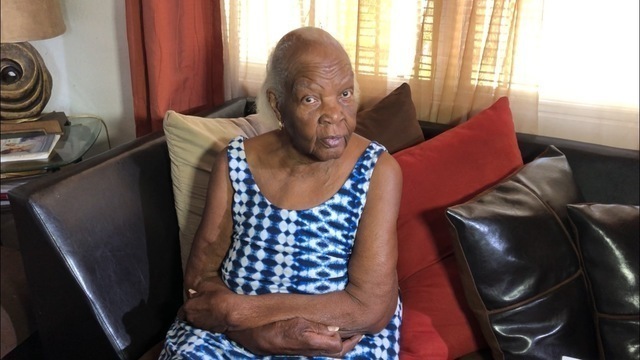 TAMPA, Fla. (WFLA) - Mamie Walker is 84-years-old, has never attended college and depends on her monthly social security check of $1,498 to survive. But for the past two months, the government has sent Mamie nothing, except a letter claiming she owes them $224,414.50. A letter from the Treasury Department claims she has been referred to them for "collection action." The letter explains up to 15 percent of each of her checks will be withheld to pay the debt. That was shocking enough, but no check came at all in February or March. She received another letter stating she won't receive another check until Sept. 2031. "I'll probably be dead by then," Walker said. "I'm so scared. I don't sleep at night because I'm so scared next week ... my lights are going to be off." Mamie says she not only never went to college, but she never learned to read or write because she had to go to work as a child to help support her family as a "field hand." Her son, Morrison Walker, stepped in to help his mother. He says she hasn't been able to pay rent or utilities and is at risk for losing her home. "I work and I try my best to help her with her bills, but now this done happened and I have my own bills, and she don't have no income and now they're trying to put eviction on her house, her water bill skyrocketed, her lights are going to get cut off," Walker said. He says he called social security multiple times and listened to "hold music" for hours only to have no one pick up. He went to a local Social Security office and says he was told it sounds like fraud, but no one offered any help. WFLA called the Social Security Administration and was told someone would reach out the family to investigate. They also called the U.S. Department of Education.